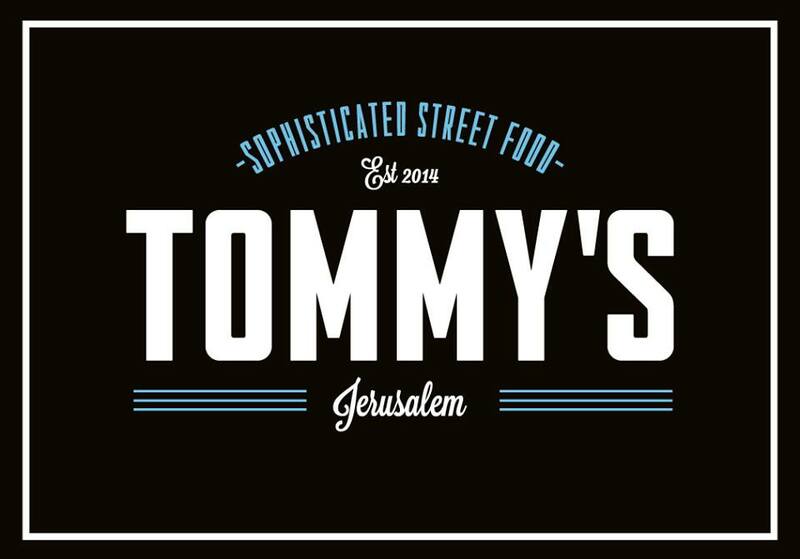 Tommy’s is a small and cool venue located on Keren Kayemet st in the heart of Jerusalem. The reason I found this little joint is because I happened to have stumbled upon a Facebook contest that they where holding. And I won a dinner for two at the restaurant, So the one night me and my wife had free, (literally) and went to check it out. 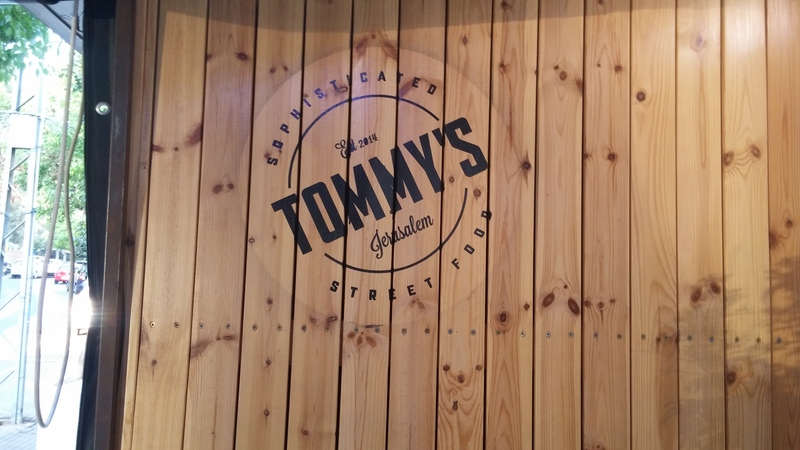 Tommy’s is a small hole in the wall type of joint that make most of the food in house, like the salads and sides. The seating area is located outdoors but there is still an element of privacy because there are no seats on the street, mainly on the patio. So we looked at the menu, and it really emphasized the name of the place” sophisticated street food”. Everything they serve has a little twist and isn’t your run of the mill fast food joint. 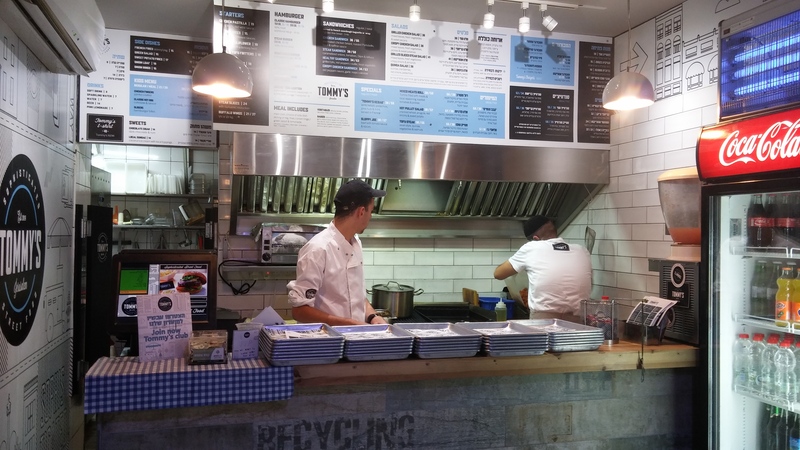 The menu is composed mainly of grilled meats, but also have different types of dishes on their specials menu. The chef also made it clear that they cook their hamburgers on the flattop, and that got me excited! 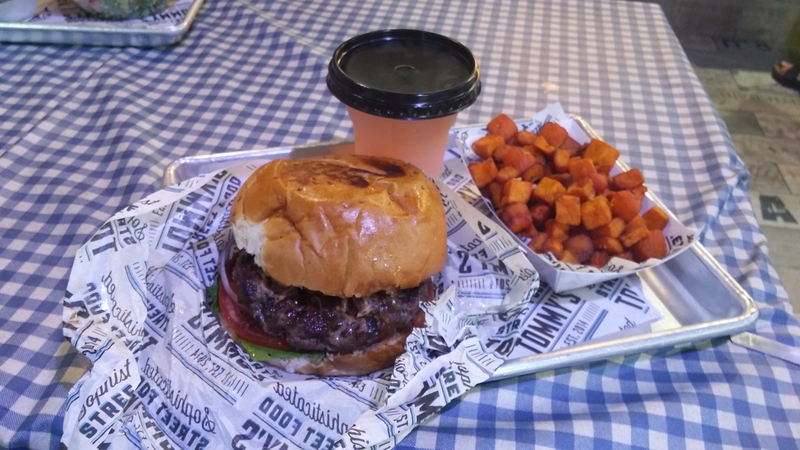 After browsing the menu and talking to the chef about what to order, we ordered a hot pullet salad(pargiyot) salad, an entricote hamburger, for the sides we ordered a blooming onion that’s made in-house, and sweet potato fries with pink lemonade. Because i’m a gentelmen I’ll start with what my wife ordered. The pargiyot saladwas really good. It wasn’t your run of the mill salad with just chicken and vegetable, it came with bulgar, arugula, sweet potato, and the chicken itself stood out by being packed with flavor. One of the better salads I’ve had at a fast food restaurant. The entricote burger was done like I asked, medium. It was very juicy and full of meaty goodness. I asked for some coleslaw on the side and it made the burger taste even better. The sides were a bit dissapionting though. The blooming onion was a mess and very hard to eat and lacked seasoning. The sweet potato fries weren’t crispy, it needed to be fried twice like a pomme fritte otherwise it just gets soggy, like in our case. what really rounded out the meal was the pink lemonade that was perfectly mixed and had a great balance between sweet and sour like a good lemonade should have. All in all it was a very good experience and you will find me returning there to enjoy another meal. but trying different things too!